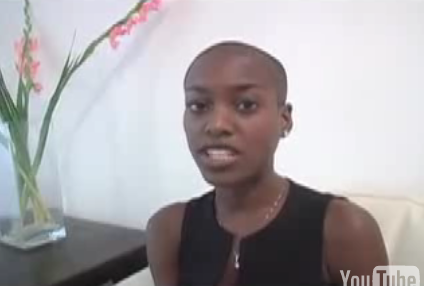 Nnenna Agba | Where are the models of ANTM now? Finishing in 6th place was Nnenna, who soared into the competition with an unforgettable first shot that showed us bald can be beautiful. So it was a little disappointing when her potential seemed to be fading as the weeks passed. With a jealous boyfriend at home, Nnenna battled the pull of the competition while trying to keep her personal life from being on display. Factor in that there was one phone for 13 girls, and you’ve all the ingredients needed for a good old-fashioned dramality. Nnenna shares with us her view of the events, her take on the heavy hand of reality show editing, and what made each girl special. Good morning, Nnenna! I have to say, I did not expect to be talking to you today. I saw the first season while I was still in college, and I thought about trying out, but I never actually thought I would get a call back. I just saw it as a good opportunity to get into the industry and to get into the industry and learn so much in a short amount of time at my age. It just seemed like the best way to go about it if I wanted a chance at modeling. Wow, that’s a good question. You know, I saw something special in every girl, and I saw great potential. Like I admired Furonda’s body because I thought she had the best runway body. Mollie Sue – her face was just so beautiful, you know, she looked like the models I see in magazines. Or Danielle, the way she walks down the runway. Or Brooke, just that she looks so exotic and is not just the face next door. Everybody had something special at them, something unique about them. I don’t think I singled any girl out in particular. I would have to say the bald photoshoot, that was my favorite. You had one of the more dramatic makeovers in that they went for a completely bald look for you. What do you think of this look? I think it worked in my favor in some situations, and worked against me in other situations. There are both positives and negatives about the makeover, but I enjoyed it. I finally got comfortable with it. It made me stand out from the rest of the girls, so overall, it was a good thing. I’m looking at the mermaid photo shoot right now, and one thing that stands out is that you’re the only one without hair to work with. Would you have liked to have a wig to pose with? The wigs they had gotten in the past looked very unnatural. I’ve had long hair before, and it’s quite different from having long hair or extensions as opposed to having a wig. And upside-down in the picture, I think it was a lose-lose situation. With a wig, it might have fallen off my head! I have an image of a mermaid in my head, and I knew I didn’t transform in the photograph. They were looking for a mermaid, and I knew I didn’t deliver. Did you feel like you had a better picture in there that they didn’t choose? I have no idea. The thing is, we don’t get to see the pictures to see which was your best and which was your worst, so I have no idea. Joanie: Joanie is extremely funny. She’s has a huge personality, and she’s just hilarious. I love to laugh, and whenever I was around her, I couldn’t stop laughing. She’s just fun. Jade: I admire Jade as a friend, but I also think she’s a very strong person. Just from my perspective, I admire her strength. And I know the portrayal that she’s had so far has got a lot of people against her, but to be honest with you, that wasn’t the impression of her that I got in the house. If I saw the same point of view that the audience is receiving, maybe it would have been different, but that’s not what I saw. Jade cooked for all the girls every other night. There was never a dull moment with her. She was always just joking around, I was always laughing because she always had something silly to say. I didn’t take her seriously, and I never saw her as a malicious person. It’s just unfortunate that the negative has been highlighted, and of course it’s quite easy to know what the audience will think of her. I didn’t have that impression that she was faking it. I felt really bad. I know on television, you see her crying and then they cut immediately to the end, where she’s no longer crying, so easily, that looks very fake. My boyfriend is in the production world, actually, and he edits, so he fills me in on a lot of stuff. So I’m not surprised at the response she’s getting. You don’t see the entire crying scene, you just see her starting to cry then it flashes to the end where she’s not crying anymore, and of course it looks that way. I don’t want to be like, everybody thinks Jade was this or that and just go along with it. From my point of view, I didn’t think she was faking it. Danielle: Danielle is just a fun-loving person. She’s a nice person. Furonda: I ended up growing very close with Furonda. She’s very intelligent, and we could hold a conversation. She’s one of the girls I talk almost every other day, along with Jade and Gina, and I email Sara, Joanie…I grew really close with Furonda. Sara: Sara is very smart, very intelligent. I didn’t get that much time to spend with her, but earlier on in the competition, I hung out with her more. She is a good person as well. Now we get to Brooke, and I just want to know how you feel about that comment Brooke made in a “confessional,” something along the lines of If she likes Africa so much why doesn’t she go back there? Before I even saw the episode, when I saw the preview commercials and they showed me laughing when Brooke was making mistakes, I emailed Brooke immediately. I said, Brooke, I just want to let you know, Miss Jay made a lot of faces, whenever anybody would go up and do something wrong, he would make faces. And I’m one of those people that is one of the first ones to laugh, and I’m working on that. I saw Miss Jay’s face and I started laughing, I never laughed at Brooke. Miss Jay stirred up most of my laughter. I emailed Brooke and told her that. Then, after I saw the episode, I was taken aback. I won’t pretend I wasn’t offended by that statement. After I saw that, I was still offended, and I wrote Brooke again. I said, you know Brooke, I’m not going to pretend that I wasn’t hurt by what you said, but I know you didn’t mean it in a harsh way. So don’t even worry about it. And we made peace. That was it, and that was the end of that. This has been a huge argument on our site ever since the episode aired. People really want to know what happened. I guess what the thing was that at the beginning of the episode, I said, “Coming to America gave me hope,” which to me means that America is a better place for me, it’s the land with more opportunity. I never said, “Africa is better, Africa is so much better.” I never once thought that I was any better than anyone else in that competition. So I don’t know where she got the impression that I think that Africa is so much better that she would say, “Go back.” I guess it just seemed out of place. I really didn’t understand, but I guess she was stressed, it was a stressful environment. I made mistakes in the competition, there are certain things that I wish I did differently; I feel it was probably the same for Brooke. So I told her, “I know you didn’t mean that,” even though I was kind of hurt when I first heard it, and we’re fine. It is in the past. How would you describe the progression of your portfolio? I started out strong at the first two photoshoots, but the third photoshoot where I had the dress, the wig, and the crown or something on my head – I didn’t like that photo. I didn’t like the doll, either. I don’t think the pictures progressed as expected. A lot of different elements played into it. I wish I brought more. I learned just watching myself during the photoshoots. I learned a lot about what I could do differently, and I’m hoping to take what I learned and do better next time. You won a lot of challenges on the show – in fact, you won the challenge the week you were eliminated. How can it be that you can win so many challenge and not win the overall competition? I don’t think the challenges mean anything. I don’t think they mean much in the eyes of the judges. We weren’t being judged on the challenges. At least you got some nice prizes out of the challenges. (Laughs) Yes, yes, yes! Definitely. I’m just really grateful to Tyra because she has opened doors for girls that wouldn’t normally have this chance. Everyone has been telling me that I didn’t cry or seem upset at the end. I couldn’t even make myself cry. I told myself, look where I am – I’m in Thailand, somewhere I wouldn’t have gone to before, and I had the ring, and I had some shopping spree prizes. It’s more positive than anything – I can’t see any negative in it, so I’m just really thankful that she chose me to even be in the top 13. I’m just thankful. When I was on the show, I thought Tyra gave negative criticism, but when you watch the show, it’s the exact opposite. Miss Jay was the one in person who was like, “Oh, I love your smile!” But when I watch the show, he was the one who pretty much said, “She’s boring. I don’t like her, she’s boring.” So, at this point, I guess I’m confused. You don’t get the big picture, the entire deliberations. When you were standing there next to Furonda in the bottom two, what did you think was going to happen? Actually, I knew I was going home. I knew! So I wasn’t that shocked. Because when it came down to the pictures, it was like, okay. The theme was mermaids. I have an image of a mermaid in my head, and I didn’t come close to that. So I wasn’t shocked at all. After the show was done filming, was there any fallout with your boyfriend that you had to deal with? My thing was, I didn’t want to discuss anything personal about our relationship over the phone. This was something that’s being televised nationally, and that was my biggest issue. That’s why I got so frustrated. I admit that I do regret a lot of the things I said, some of the harsh words I used, but that was kind of to catch his attention and stop him in his tracks. But I think it backfired because it hurt him, and that’s not what I intended. We’ve dealt with the show and how the whole incident was portrayed, and we’re trying to move past it. I’m glad to hear that, because it seemed so up in the air. I have been very apologetic to him. They didn’t show me being apologetic about the kiss with the male model and all that stuff, they just showed me being nonchalant. But we had already talked about it. When he came to visit me, they didn’t show the high moments, like when I cooked for him, we made out, or whatever – they didn’t show any of that. They just showed my downtime. And they showed me saying, “Oh, I’m indifferent.” But indifferent, that sentence, didn’t even belong in that situation, we were talking about something else. I was upset with him when he showed up because we had been arguing on the phone. When people are relationships, when you’re mad, you’re mad. It doesn’t mean you don’t love that person. But once he came, it was five minutes with him and I could feel we were back to normal again. We made up soon after he was in the house for a few minutes, and that was it. At the beginning of the season, Jay Manuel said in an interview that he was really excited to meet one of the girls, and to watch for his reaction. Well, we did, and we can’t tell which girl he was talking about. Was it you? (Laughs) I can’t tell who he was talking about! I don’t know who he was talking about. I think we should ask him. Well, you probably have a better line to him than me. (Laughs) Yeah, I don’t know who he was talking about. What’s ahead for you, Nnenna? Do you plan to pursue a career in modeling? Yes, I’m planning to. I’m moving to New York, and I’m going to work hard to make myself more marketable and do whatever it takes. I’m just going to work at it and be optimistic, and hopefully somebody will be interested in picking me up or working with me. Thanks to UPN for granting the interview, and good luck to Nnenna in New York! Since she had brought up Brooke, I told Nnenna that during our interview with her, Brooke said she was very sorry about the fight she had with Nnenna. “We totally… that is in the past.” Nnenna explained that Brooke didn’t mean anything by what she said, and acknowledged that she wasn’t perfect in the situation either. “That’s why I apologized to her.” But rest assured, the two girls have moved on, and are so past it. Now Nnenna’s plan is to move to New York. “I would like to work with many different photographers and try to get into an agency.” Look at the girl. She may have been eliminated from America’s Next Top Model, but we hardly think this is the end of the road. No… I think that we have only just begun to see Nnenna. But maybe Nnenna will have a lot of incoming modeling offers soon. She is moving to New York City next month to pursue modeling full time.